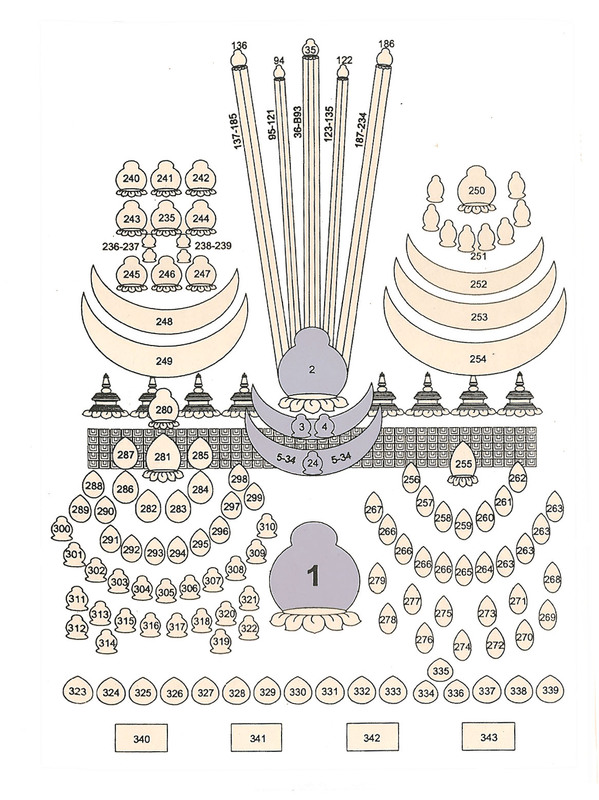 In the Yungdrung Bön tradition, the place where the deities and objects of veneration are gathered is called the “Tsok Zhing”, the “Field of Accumulation”. It is also sometimes translated as the “Field of Merit” or the “Merit Field” because what is being accumulated by paying homage and making offerings to this place is merit, or virtue. 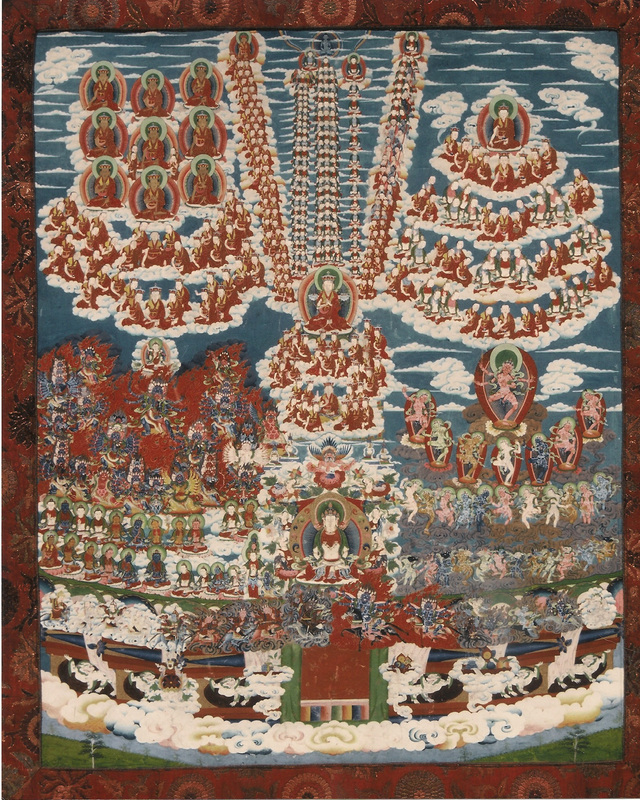 The Merit Field consists of the images of the enlightened deities and protectors which represent Enlightened Body, chortens which represent Enlightened Mind, and scriptures and the sound of mantra which represent Enlightened Speech. The lower section of the Merit Field also contains unenlightened but powerful and worldly protectors that are oath bound to protect the Yungdrung Bön. There are many different depictions of the Merit Field according to different lineages. However, the most well-known image is the Merit Field according to the tradition of Menri Monastery. The Merit Field is depicted in a very specific way and this is the proper guide for a practitioner’s visualization. Because this Merit Field is based upon the Menri tradition, the central figures are primarily associated with the Menri Monastery. 1. The glorious teacher who has blessings and who has the nature of all of the collective Victorious Ones, the all-good essence of the kind root lama, Shenlha Ökar. He has the 25 mudra of the Perfected Enjoyment Body. He wears the 13 peaceful ornaments and has the 9 ways of purity. He has the 32 major marks and the 80 minor marks. He has the 40 items of nobility and he radiates forth a million rays of light. 2-34 are the abbots of Menri Monastery. Beside each of the names is the year in which they became abbot of Menri Monastery. 2. The one who united the three transmissions, the Second Buddha, Nyammé Sherap Gyaltsen. He has the appearance of a fully ordained monk. He held the knowledge of the doors of Bön without any exceptions. He was the abbot of the prestigious Yeru Wensaka Monastery in Tsang, Tibet. It was destroyed by a flood and mudslide in 1386. In 1405, he established Tashi Menri Monastery according to the Bön Dru lineage with artifacts that he had recovered from the ruins of Yeru Wensaka. At its height, Tashi Menri Monastery could house over 300 monks and had four colleges. It was completely destroyed during the Chinese invasion in 1966. 3. The regent of the Guide who was the Second Buddha, Rinchen Gyaltsen. He became abbot in 1415. 24. Nangton Dawa Gyaltsen, also known as Sonam Gyaltsen. In 1834, he founded the renowned Yungdrung Ling Monastery. 25. Nyima Tenzin, 1836. 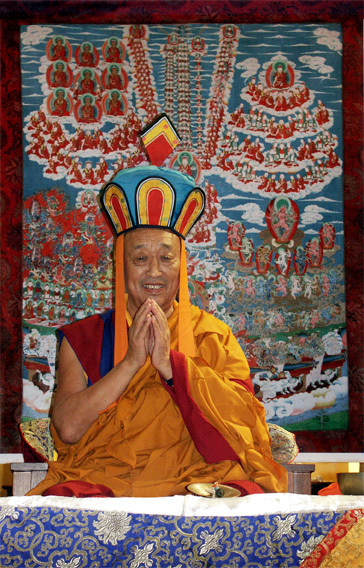 He was also one of the main teachers of Yungdrung Ling Monastery. 34. Sherap Lodro. He is the first abbot of Menri Monastery in Dolanji, India. 1968. Upon ordination as the 33rd throne-holder of Menri Monastery, he was given the name Lungtok Tenpé Nyima. Posted on December 6, 2014, in Iconography, Tibetan Culture & History, Tibetan Lamas, Yungdrung Bon Monasteries and tagged Menri, monastery, monks, tibet, Tibetan history, Yungdrung Bon monastery. Bookmark the permalink. Leave a comment.